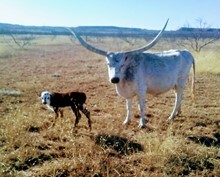 Sand Creek Ranch raises Registered Texas Longhorns in Elk City, OK. Welcome and Thank You for visiting Sand Creek Longhorn Ranch. Having raised registered Angus cattle for over 20 years, I have an eye for and appreciate the beauty of a "well rounded" cow. While many breeders prioritize tip to tip (TTT), which is indeed important, I am trying to breed animals with TTT combined with the other important Longhorn attributes of conformation, color and total horn and breed for a more fuller bodied cow with quality udders. 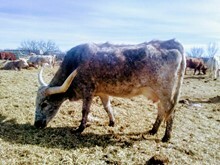 I think a deeper body, complete with fuller hind quarters, is important for these Longhorn cattle while still maintaining their moderate frame size. Because these are my breeding program goals I have sought out herd sires that I think will successfully accomplish this job such as MMW Gorilla. He will thicken up my McGill/Wilson bred Longhorns who already posses the extensive TTT and TH , with color for the next generation of 100" type Longhorns. Another herd sire who is keeping us on track at Sand Creek Ranch is Trail Dust 40. Who is 6 time world horn champion & 10 time world record breaker for longest total horn. Many breeders, unless they have done their research and seen this amazing bull in person, don't realize what he is producing and we're excited to show off his calves with the Sand Creek brand in 2015. I also believe in AI and flushing to enable us, as breeders, to reach our goals more quickly. I plan to bring in the most powerful genetics in the breed through the use of AI and flushing to complete this goal and add new bloodlines in my herd. We hope that you'll review our herd through the following pages and consider a visit to our ranch. Feel free to contact me any time with questions or to schedule a visit.